Sakura Mamiya is the heroine and narrator of the story. Sakura was spirited away as a little girl, but comes back with Tamako's help, and gains the ability to see ghosts and spiritual beings. 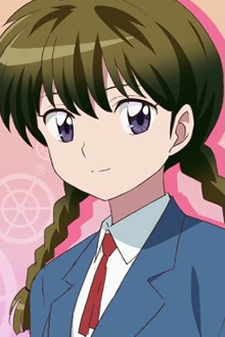 Thanks to that, she is the only human to initially see Rinne and not to be scared by Rokumon's demonic appearance. A very calm girl, she does not hesitate to scold Rinne if she thinks he is creating problems for her friends. Also, she tends to let herself get into the mood of things, once coming into a line of old men and women's souls who had lived their lives to the fullest and almost getting onto the wheel of saṃsāra until Rinne rescues her. As the story progresses, it is hinted that Sakura begins to develop feelings for Rinne off and on. She never shows much jealousy, though, when Ageha gets close to Rinne.